This is indeed a moment of pride and honour to me. Indeed to the whole TA community back home in India. A great honour to be in the league of legends like Fr. George Kandathil and P.K. Saru, my gurus back home and people like Robin Fryer, Trudi Newton and Carol Solomon whom I admire and revere a lot. It was indeed Robin Fryer who mooted the idea of nominating me. Thank you, Robin. Thank you, ITAA. When I was nominated I asked myself, ‘What have I done to deserve this great honour?’ I was not sure then, am not very sure still. I told Robin, ‘I trust the wisdom of yours – the collective wisdom of my friends and colleagues who nominated me.’ On reflection I found I am being rewarded for doing what I consider as my Dharma – my duty as a responsible member of the ITAA. A reward that was least expected – what a privilege! This confirms my belief in the notion of ‘karma’ – whatever we do has its consequences. Every action comes with its result. What we give out to the universe the universe never fails to return to us its rewards in bounty; in abundance. I’m ever grateful for this blessing! Twenty years ago when I discovered TA it was a moment of rebirth and a new beginning to me. I discovered myself and my inner potential. It helped me transform myself from a shy and timid small town lad from south India to a fine person and a competent professional. I’m ever grateful to the huge role ITAA played in that transformational process – through its kind members and its generous TAlent programme. Twelve years ago in 2001 when Elana Leigh asked me to join the TSC, she saw the hidden resource in me which I myself was not aware of. That was a moment of déjà vu – another moment of rebirth and a new beginning. This time to give back a bit of what I received in abundance from the ITAA. My association with the T&CC and the BOT ever since has enriched me beyond what I signed up for. I’ve met wonderful people, made loving friends, visited distant lands, built enduring relationships and above all enjoyed the process of turnaround of the ITAA from within – the birth and new beginning of a resurgent ITAA. We moved from a position of scarcity to that of abundance; from a state of panic and despair to that of hope and rejuvenation. I feel privileged to be part of that renewal process. To top it all, my own friends and colleagues in the ITAA found me deserving to be rewarded with this prestigious award. What more can one ask for in life? I feel touched and humbled by this act of generosity and love from my peers. So many people contributed to my making – to my growth and development – to my journey of life to this point. I’m grateful to each and every one of them. To begin with – my mother who expected nothing less than the best from me. My wife and my extended family stood by me always and encouraged me in all my life choices. My friends, colleagues, trainers, trainees, students, clients – each one of them helped me mould myself to be the person I am. My caretaker, Mr. Dhandapani, when I was young and the wise Prof. Ramakrishnan, during my MBA days planted the seed of gratitude and social responsibility in me. They were the ones who taught me the virtue of giving back to those who give us selflessly – people, institutions and society alike. My nominators – Robin Fryer, Bill Cornell, Laurie Hawkes, Ann Heathcote, Elana leigh, Charlotte Daellenbach, P.K. Saru, Susan George, A. Geethan, Chitra Ravi, Sailaja Manacha, Annie Cariapa, Anna Chandy and K.A. Sebastian, Gianpiero Petriglieri, T.S. Radhakrishnan, Ragini Rao, Gunasagari Rao, and K. Raguraman. Thank you! My friends on the BOT of the ITAA – thank you! Last but most important of them all, Mohan, my friend and colleague who stood by my side in every step of my life journey – TA and otherwise – over every single day of my last 30 years – who often was my conscience during times of uncertainty – who silently inspired me to bring out the best in me as a person. 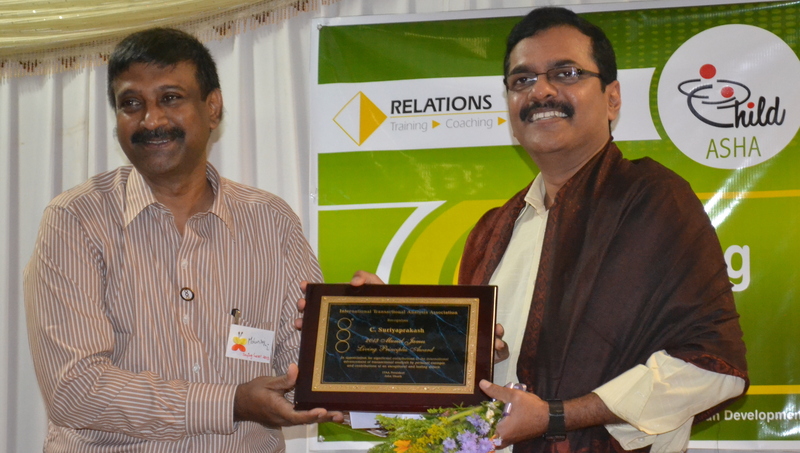 I dedicate this award to you, Mohan! Thank you! Thank you all being part of my third rebirth and a new beginning!